RPM Rear Upper & Lower A-arms for 1/16 E-Revo, Blue Discounts Apply ! 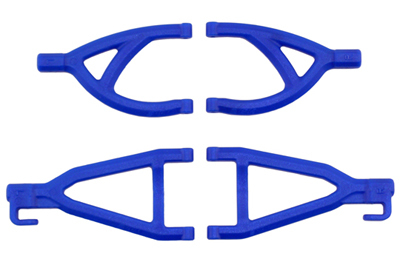 RPM80605 - RPM Rear Upper & Lower A-arms for 1/16 E-Revo, Blue. Similar to RPM front A-arms, our rear arms eliminate nearly all of the A-arm slop typically found in stock Mini E-Revo rear A-arms, allowing camber and toe angle settings to be more solidly fixed in Rear A-arms position. The result: A smoother, more consistent suspension system with a significantly reduced tendency for the truck to randomly wander while driving. RPM Mini E-Revo rear A-arms are sold in sets of four, both upper and both lower A-arms. What�s best? What's best is these miniature E-Revo A-arms, like all RPM molded products are backed by our industry-leading breakage warranty. If it breaks (under normal operating conditions), send it in and RPM will replace them.